Trinidad played fighting and courageous soccer at the Kensington Oval yesterday afternoon, for the greater part with ten men, to get another one-all draw with Barbados, in a second Test match bubbling over with incidents and excitement. When Barbados had a penalty goal to their credit, 20 minutes after the start, Referee Herman Griffith put Ahamad Charles Trinidad centre-forward off the field, but from then on the visitors put more life into their game, and playing with greater determination smashed home an equaliser, a minute or two before half-time. It was a match of penalties, for no fewer than three spot-kicks from the ten-yard spot were given. Mike Foster scoring one and missing the other of the two Barbados got, while Rex Bernett ballooned Trinidad's award high over the bar. With the scores level and less then a minute left to play Barbados received their second penalty. Amid tense excitement, Mike Foster, who had bulleted home a beauty in the first half, kicked high. Rex Bernett made amends for his missed penalty kick, by ramming home an unstoppable shot which earned the 1-1 draw. With both Test matches drawn, the deciding game on Wednesday should be brimful of interest. Yesterday's game grew into a rough affair, and in the second half, Referee Griffith had to bounce the ball on four occasions, when players of both teams went for the ball. It was a grand defence play that saved Trinidad and in a broadcast after the match, Capt. J. O. Cutteridge said that Raffie Knowles played a real sterling game at centre half and carried the team on his shoulders. Barbados, Captain Cutteridge said, were very dangerous in the final ten minutes. In his broadcast at the interval he also spoke highly of the display of Joey Gonsalves, St. Mary's College player, who was making his first appearance in a Colony match and said that he had effected some extraordinarily good saves up to then and St. Mary's and Hem boys should be pleased to hear this. There were two exciting moments in Trinidad's goal area in the first 11 minutes of play. C. B. Williams, Barbados inside left miss-kicked to muff one chance while Gonsalves made a grand save from a shot by Robinson, who yesterday lined up at centre-forward, instead of his first match position at left wing. Yesterday, Barbados played Robinson at centre forward, shifted Sam Griffith to right wing in place of Frankie Morris and John Foster was brought in at inside left. 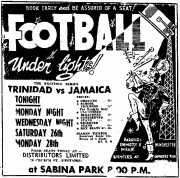 Trinidad also made changes, Joey Gonsalves saving in place of Merrit, John Sampson coming at full-back vice Dudley Husbands while Ahamad Charles was played at centre forward, and the forward line shuffled so that Nattie Sealy was dropped. The first incident took place about 15 minutes after the start of play. Griffith kicked a long shot and while Gonsalves gathered, Sampson ran across and charges Robinson unnecessarily. Referee Griffith awarded Barbados a penalty, and Mike Foster who ran all the way from the back line to take it put a beauty in the corner of the nets. And No. 2 incident was not long in coming. An appeal for hand almost on the penalty area line started it, and Charles was put off the field. The match, seethed with interest and grew more exciting every moment. King, Barbados goal-keeper on being tackled, fell and in getting the ball away threw it on Mike Foster's hand, and Trinidad was awarded their penalty. Rex Burnett took the shot and placed it high over the bar. Trinidad played like demons at this stage, but Barbados raids were also dangerous, and the visitors had a narrow shave when Robinson ran around Warner, and getting on an angle on theleft side shot, but the ball went right across the goal, outside. Trinidad got their equaliser a moment or so before half time. The goal was started by Bertie Thompson and resulted out of a brilliant bit of combination and football strategy by the veteran Thompson and "Sackie" Govia. An interchange of position figured in the move, then the ball was given to Rex Burnett who beat King all over with a shot Captain Cutteridge described as unstoppable. First bit of action in the second half was a beautiful left shot by Carlton Downes, which just went over the bar. Then John Foster missed a golden opportunity, the ball was too fast for him to get it first time. Medford made a brilliant run after this but Gonsalves saved. Play at the midway stage in the second half was very exciting as Trinidad played a very tenacious game, Barbados attacked, Williams hit the uprights with a nice shot and Smith dropped one on the nets. McLean, Trinidad half-back, was playing a real fighting game, and from a free kick by him King punched away nicely. Robinson had it all by himself next in a brilliant run-through but he missed. Barbados pressed in the last ten minutes. Ishmael tried at goal and John Foster threw himself full length in an effort to score, but to no avail, and some time later Sampson muffed a chance, Gonsalves then fell, but Sampson cleared a dangerous situation. Then came the final minute and Barbados received theri second penalty. Mike Foster kicked it out. TRINIDAD: Gonsalves; Sampson, Warner; Jones, Knowles, McLean; Thompson, Govia, Charles, Burnett and Downes. BARBADOS: King; Walcott, M. Foster; Ishmael, H. Griffith, Medford; S. Griffith, J. Foster, Robinson, Williams and Smith.